Simon Spurrier is a writer with big ideas that have brought a lot of depth to the Marvel superheroes he’s been writing over the past few years, but it’s always nice to see him let his imagination run wild on his creator-owned work. 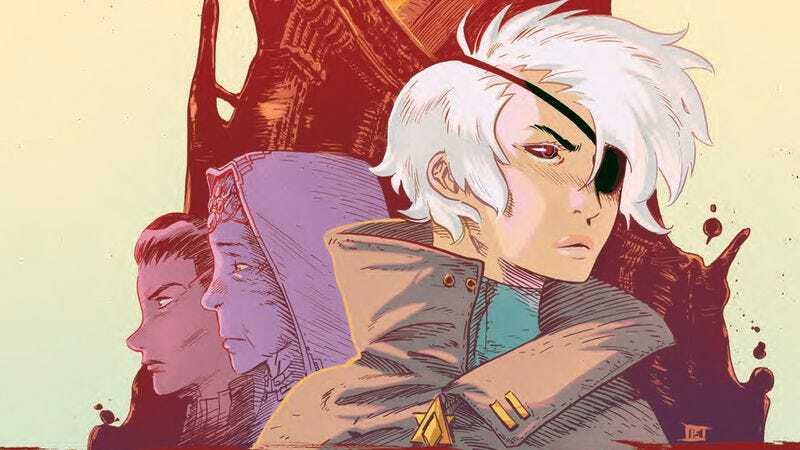 For his latest project, The Spire, he reteams with Six-Gun Gorilla artist Jeff Stokely for a murder mystery in a rich fantasy environment, allowing Spurrier to riff on the cop drama through a genre lens that gives Stokely the opportunity to draw a wide range of strange, spectacular locales and characters. The first issue featured some gorgeous visuals as the creative team introduced the setting and cast. Colorist André May uses a pastel palette that brings an inviting softness to the artwork, easing the reader into the titular location by highlighting its beauty before revealing the darkness on the streets. Political tensions are high in this xenophobic community, and they may be the motivation behind recent killings, including the one that ends this preview of next week’s The Spire #2. These pages highlight the social conflict in Spurrier’s story and Stokely’s evocative character designs and panel layouts, and May’s pastels continue to create a sense of calm right until things go to hell in the final bloody panel, ramping up the tension for the rest of the issue.